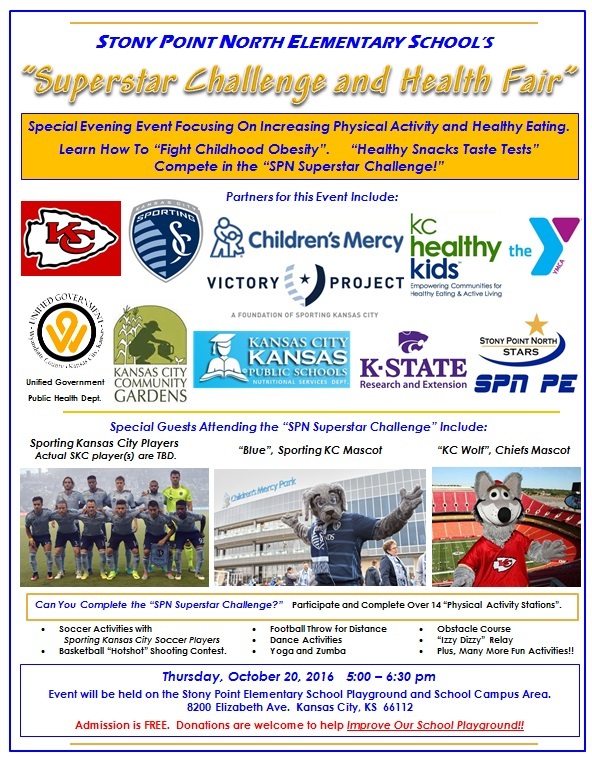 Special PE Project: Stony Point North's "SUPERSTAR CHALLENGE and HEALTH FAIR"
Special Guests attending the event include members of Sporting Kansas City Soccer team, “Blue”, the Sporting KC mascot, and “KC Wolf”, the mascot of the Kansas City Chiefs!! The Stony Point North “Superstar Challenge” consists of “Physical Activity Stations” on the SPN playground and school campus. Complete the “Superstar Challenge” for the chance of winning special prizes. information on nutrition, childhood obesity, and additional health related information. 2. Stations with a variety of “Taste Tests” to sample healthy nutritious snacks. 3. Students and adults received recipes for creating more nutritious meals and healthy snacks. Over 450 people attended and this activity was covered by two local TV stations. To view many of the photos taken at the "Superstar Challenge and Health Fair" click on the photo below. 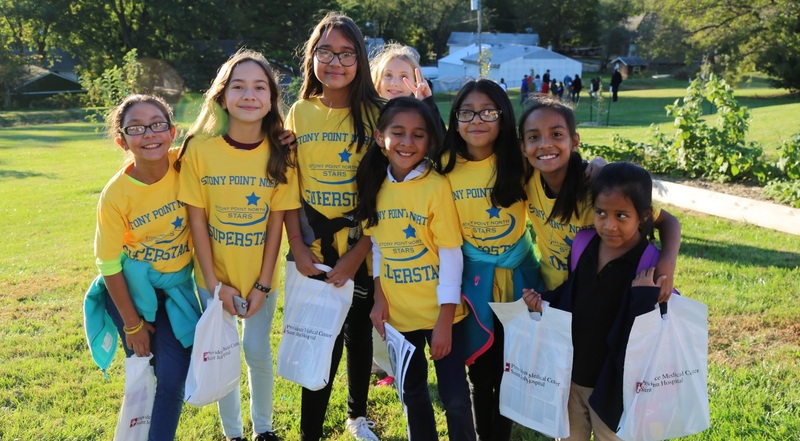 On October 16th, Stony Point North Elementary School hosted a special evening “Fitness and Wellness activity” for our students, parents, and community members. The primary goals of this unique event were to increase our awareness of the need to “fight child obesity”, to increase our knowledge about the importance of daily physical activity and healthy eating for students and adults, and to raise money for the SPN playground. A recent report indicated that Wyandotte County ranks last at number 101 out of 101 counties in the state of Kansas for obesity rate and negative health factors. Also, in another recent report, “Kansas now has the seventh highest adult obesity rate in the nation, according to “The State of Obesity: Better Policies for a Healthier America” released September 2016. The information from these recent reports is very disturbing to us and we definitely don’t want the past to predict the future of the health and wellness of our students and the community members in Wyandotte County. A group of 5th grade students at SPN have been working very hard tthrough their PE classes on planning this very unique activity and it has been THEIR GOAL TO MAKE A DIFFERENCE!! We are very excited about the organizations that have partnered with Stony Point North for this event.